It's been two days since the the EU referendum results. In that time we've seen the Prime Minister announce his resignation. Today moves have been made to oust Jeremy Corbyn as leader of the Labour party. And questions are being raised about whether Boris could be the next PM. Southampton is one of the only places in the South with both a Labour and Conservative MP. So how have people there reacted to the post-Brexit politics? Philip Hammond also said "we will not be able to negotiate migration and at the same time full access to the single market." His comments were made on this morning's Robert Peston show on ITV. The lead singer of Oxford's Radiohead, Thom Yorke, has signed and tweeted a petition calling for a second EU referendum. More than 1.2 million people have now added their signature. More than half a million people have signed a parliamentary petition calling for a second referendum of the UK's membership of the EU. An unprecedented surge of people trying to access the page briefly caused the official petition website to crash as many Britons shocked by the referendum result tried to engineer a re-run. Our reporter Rachel Hepworth has been speaking to people in the Thames Valley about their reaction to the decision - in the referendum - to leave the European Union. How will Brexit affect freight trade? One group of people who interact with Europe on a near daily basis are the South's lorry drivers. Companies based in Kent are used to deliver freight across the continent. During the Referendum, the Freight Transport Association took a neutral stance. But now they say there is an element of uncertainty over how goods will be moved through Europe and they are keen to ensure the 'simple trade agreements' already in place continue. So what do drivers in the haulage trade think about the vote in favour of Brexit? ITV Meridian understands that David Cameron will remain as MP for Witney after he steps down as Prime Minister. David Cameron announced his resignation as Prime Minister this morning, after the Referendum results showed that Britain had voted to leave the EU with a majority of 51.9%. Although he is due to hand over the role of Prime Minister before the Conservative Party conference in October, David Cameron will continue to serve as MP for Witney in Oxfordshire. The full list of referendum results for South East. 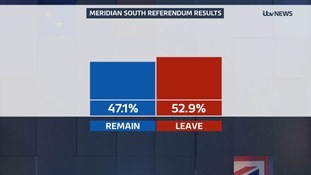 Overall the area voted 55.4% in favour of 'Leave'. For many families who have come to live here from other EU countries, there is now a feeling of great uncertainty. In Southampton 1 in 10 people are Polish - among them - the Fratczak family. People on the Isle of Wight have been having their say about the Referendum result.